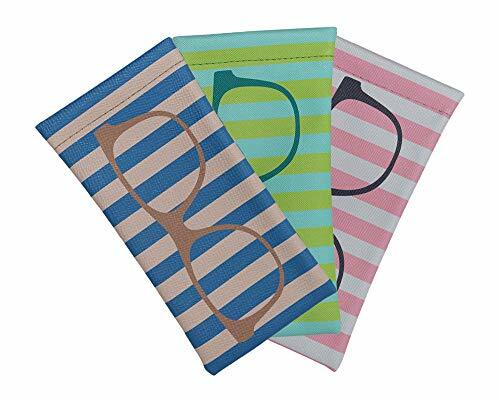 Indulge yourself with these elegant high quality squeeze top eyeglass cases each featuring an image of glasses showcased on a vintage pastel blue and peach striped background, lime green and teal striped background and pink and white stripe background. Enjoy the security of a hard case with the convenience of a classic slip in case. Your glasses won't accidently fall out! Each beautiful eyeglass case is easy to open and snaps close securely by a squeeze top frame. Giving you a lightweight, slim, and protective case without having the weight or hassle of snaps, and zippers. The squeeze top frame is strong enough to handle daily opening and closing while still allowing you quick access to your glasses with a simple one handed squeeze. Each case is beautifully crafted and stitched together with care creating a sophisticated and stylish case for your medium to large eyeglasses, sunglasses or reading glasses. The soft interior cotton blend fabric lining protects your lenses from scratches and dust. Created specifically for women's, men's, or kid's glasses, these well designed and expensive looking cases would make a great accessory to any pair of medium to large frames. In addition to storing your glasses these cases can also be used to tastefully conceal other personal items such as make-up, phones, spare change, or even feminine hygiene products. With so many uses and functions these cases makes the perfect gift! Be sure to order enough for your whole family's needs. Hand packed with care in Dallas, Texas. SLIM STYLIST DESIGN allows you to save space in your bag while spring top closing system grants you quick access to store your sunglasses or reading glasses. Just squeeze the sides to slip in your eyeglasses and go!